This title presents an excellent introduction to the stories of the Bible, from creation to Jesus' birth, death and resurrection. Featuring bold bright pictures and simple words, this title is ideal for independent reading in the 6-10s age range. Its nature of the illustrations and choice of stories are designed to have a particular appeal for boys. It is written by an experienced, published author. Cased format makes this book an ideal gift at any time of year. It is a fun and punchy read for children. It is suitable for 6-10 year olds. It is an ideal gift especially for boys. It is recommended for Sunday School prizes. With its bold illustrations and exciting choice of stories, this book has been designed to appeal particularly to boys, although girls will also enjoy the creative story style and excellent illustrations. The stories follow the storyline of the Bible and cover many Old Testament favourites, such as Creation, Joseph, Moses, David and Goliath, Jonah and Daniel before moving to the story of Jesus from his birth to his resurrection and the promise of the Holy Spirit. 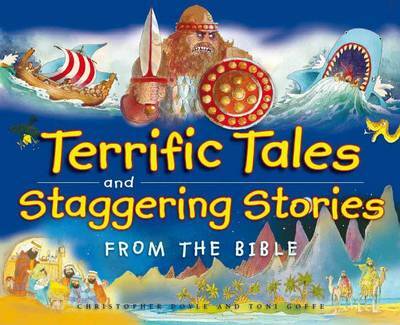 In this respect, the stories give the reader an excellent overview of the Bible, helping children to become familiar with the stories and identify with the storyline.